Hello Bear Trap Dunes (BTD) homeowners and guests. 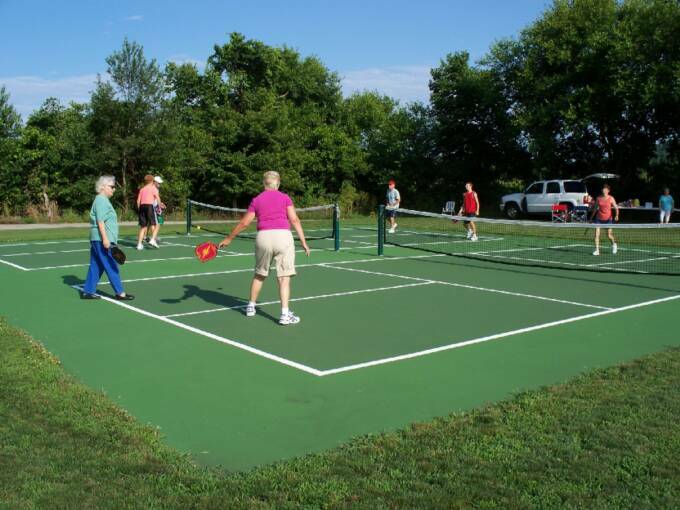 BTD offers Pickleball play on two hard surfaces courts. Play can be scheduled through contacting Pavilion staff on first-come availability for one hour time periods. An average game play is 12-15 minutes. BTD joined in 2017 a league called Coastal Communities Pickleball League (CCPL) which includes 14 total neighborhood communities from the Ocean View area. Each team averages 15 participating players. CCPL has offered and completed both a Spring and Fall scheduled team play schedule. The proposed schedule date has been confirmed for implementing the 2019 CCPL spring 7-8 week program. League Play will be scheduled for every Wednesday morning beginning on May 1st. Play will be assigned to those communities who offer more than two courts. Bear Trap Dunes will not be initially assigned to host team play so other community sites will host as they offer more than two (2) home courts. However, BTD practice play (March/April) will be coordinated and scheduled at Bear Trap Dunes based on interest/availability. Pickleball is a racquet sport that combines elements of badminton, tennis, and table tennis. Two, three, or four players use solid paddles made of wood or composite materials to hit a perforated polymer ball, similar to a wiffle ball, over a net. The sport shares features of other racquet sports, the dimensions and layout of a badminton court, and a net and rules similar to tennis, with a few modifications.